The first workshop session is Sunday, June 23 titled, PIP, PIP Hooray! Using Creative Problem Solving to Promote Wellness. Description: PIP (Problems-Ideas-Plans) is a fun, creative tool for teaching problem-solving skills. It is brief, engaging, and can be used by both youth and adults in a wide range of settings. Improving decision making, creativity, humor, and flexibility are all things that allow us to problem solve more effectively and feel more positive and empowered. During this interactive workshop, participants will learn how to use the PIP, develop new approaches to solving problems, and come up with action steps to promote wellness. A safe web site for young people to directly access for better understanding mental illness is called the Experience Journal (www.experiencejournal.com) created by Boston Children’s Hospital. Also for direct use by youth is this iGROW tip sheet on loss and grief. Suggestions for parents are provided by Riverside Community Care in this summary – Talking with Your Children About Traumatic Events and this iGROW tip sheet reminds us of how to maintain the conversation. Referral for advice and counsel can start with a pediatrician; several communities may access assisted referral through www.MSPPreferral.org. McLean Hospital offers a remarkable depression treatment resource without charge for certain youth, please read page two of McLean study with healthy adolescents. 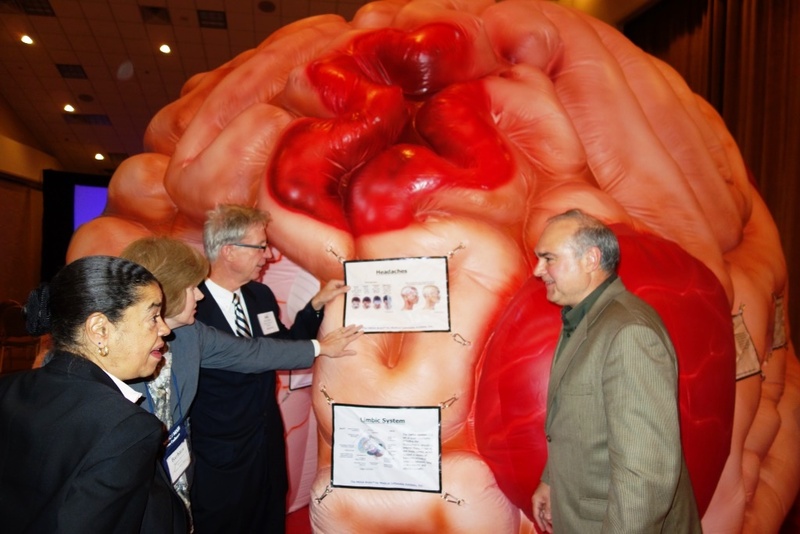 The walk-through brain exhibit publicizes resources for keeping healthy kids healthy by practicing wellness activities. Two significant benefits that result from wellness activities are better academic performance and fewer cases of mental illness. At this year’s joint conference in Hyannis, over 600 school superintendents and school committee leaders received a wellness resource from the Boston Children’s Hospital curriculum to keep healthy kids healthy. The hope is that each will view the 37 minute documentary and consider it for use in their district for all students in grades 8 and higher. The Break Free From Depression documentary and curriculum replaces stigma with knowledge, normalizing conversations about symptoms of anxiety or depression, and provides wellness activities to prevent the symptoms. The Mega Brain exhibit was provided by Adolescent Wellness and Medical Inflatables. Wellness Curricula resources are now available for families and communities to help keep kids healthy, which would achieve the National Prevention Strategy (page 49) goal MHMD-4.1 (page 49) to prevent adolescent depression. The resources enhance the protective factors for individuals; their importance is illustrated by the graphic on page 15 of the 2012 National Strategy For Suicide Prevention. collect follow-up data in each of the above categories. The long term ‘Seattle Social Development Project’ study calculates that students who participate in school-based programs focused on social and emotional learning (SEL) profit in multiple ways. Compared to students who do not experience SEL programming, they increase revenue and reduce state spending.